Located in East Boca Raton, Palm Beach Farms is a luxurious community of one- and two-story single-family homes situated on large lots within a family-friendly atmosphere. Homes for sale in Palm Beach Farms have spacious floor plans with three to five bedrooms ranging from 1,400 to over 6,700 square feet of living space. Originally built in the late 1980's and early 90's, many of the original homes in Palm Beach Farms have been completely remodeled and updated to include modern high-end features and contemporary architectural designs. There are also many newly constructed homes in Palm Beach Farms, which contribute to the community's increasing home values and provide homebuyers with a wide range of homes from which to choose. Palm Beach Farms homes offer many luxurious features including open floor plans, tile or wood flooring, luxurious updated bathrooms, two and three-car garages, gourmet kitchens with granite countertops, stainless steel appliances and custom cabinetry, walk-in closets, and tropical swimming pools. With peaceful surroundings, spacious interiors, and flourishing Florida landscaping, Palm Beach Farms provides residents with a quiet and relaxing atmosphere where they can enjoy the South Florida lifestyle to its fullest. Palm Beach Farms is located in the heart of Boca Raton, just north of Hillsboro Road between Military Trail and I-95. With its central location, Palm Beach Farms residents have easy access to some of the area's best attractions which include a broad range of boutique shops and fine restaurants, as well as a host of amazing entertainment options. Palm Beach Farms is just a short drive to the Atlantic Ocean and all of the action and excitement happening in downtown Boca Raton. It is also convenient to the area's major highways, making it easy for residents to make their daily commute to work or to visit neighboring cities like Delray Beach, West Palm Beach, and Fort Lauderdale. Palm Beach Farms is also located within one of Boca Raton's top-rated school districts, which includes Addison Mizner Elementary School and Boca Raton Community Middle and High Schools. If Palm Beach Farms sounds like a place that you would love to call home, you should also visit some of the surrounding communities in Boca Raton such as Camino Gardens, New Floresta, and Royal Oak Hills, all of which also provide luxurious single-family homes within a family-friendly setting in Boca Raton, FL. 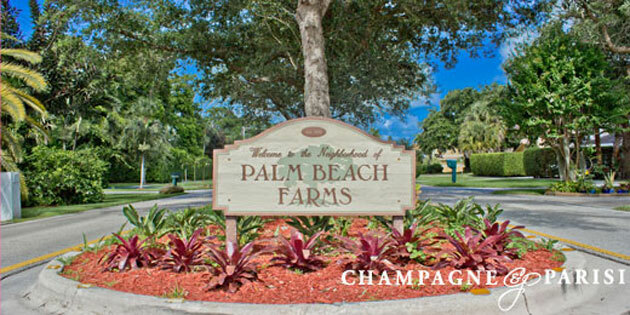 If you would like to learn more about Palm Beach Farms or any of the surrounding single-family home communities in Boca Raton, please contact Champagne & Parisi Real Estate at 561-998-9015. You may also reach us by completing the simple online contact form provided below. We look forward to assisting you in finding your next Boca Raton dream home!